Here is the intimate story of C.H Spurgeon, one of the greatest preachers in the history of the church. We follow Spurgeon from his youth where, as a young preacher he is surprisingly called to minister in London and soon captures the love and respect of the nation. Spurgeon will go on to become one of England's most influential and beloved figures. This powerful, inspirational docu-dama faithfully recreates the times of C.H. Spurgeon and brings the “people’s preacher” to life as it follows his trials and triumphs with historical accuracy. Made by the award-winning Christian Television Association and filmed on location in England, Scotland, France and Germany, this film vividly captures the spirit and message of a man whose eventful — and sometimes controversial — life is highly relevant to the twenty-first century. An international coproduction with CTA Productions in association with Christian History Institute, CWR (UK), ERF Germany. Written, produced and directed by Crawford Telfer. Presented by Andy Harrison, featuring Christopher Hawes and Stephen Daltry as Spurgeon (younger and older), and introducing Sarah Mardel as Susannah Spurgeon. Music by Steven Faux. Executive Producer Malcolm Turner. Combining drama with documentary information, this DVD on the life of Charles Haddon Spurgeon, one of the greatest preachers and writers in Biblical Christianity, is an effective production. Spurgeon's spiritual struggles as a young person will strike a chord with today's youth who experience similar conflicts. His later victories and setbacks as a pastor will resound with today's pastors and church people. Factual information will interest those who study church history, including Baptist history. Above all, the recurring theme of always "looking to Jesus" in the daily uncertainties of life is a challenge to everyone who wants to love and serve the Lord. Charles Haddon Spurgeon was a true man of God. This documentary unveils the story of the youth who became one of the most influential men of his time and one of the greatest preachers in history. As a teenager, he captivated masses in London with the gospel. He continued to guide the church through murky times and remained a powerful voice for years to come. This documentary portrays Spuregon's life accurately (even some negative aspects) and creatively. Recommended for young adult or older Christians because of the unbiased and often completely realistic portrayal of the preacher's life. A lad from rural England goes to London where he earns the love and respect of a nation. But his principles run against the grain of the culture, and he is isolated, ridiculed and broken-hearted. Made by the Christian Television Association and filmed in England and France, C.H. Spurgeon captures the spirit and message of Spurgeon as the people's preacher. This docudrama presents reenactments of scenes from Spurgeon's life and ministry with interviews of historians at key locations from Spurgeon's life. The film begins with a brief description of Spurgeon's upbringing as the son and grandson of ministers. Even with such a solid Christian upbringing Spurgeon struggled with his faith until as a teenager he visited a Methodist church simply to get out of the cold. The worship and preaching he experienced there began the spark for his calling as a preacher. We follow Spurgeon from his first postition as pastor in a country church at the age of 17 to being called as a pastor to a struggling city church in London at age 19. Spurgeon's reputation as a plain spoken and passionate preacher quickly thrust him into notoriety. With this notoriety came not only many who wished to hear his sermons but many who critiqued him as well. Throughout his ministry, rather than being caught up in his fame, Spurgeon continued to struggle with what could best be described as depression or perhaps a dark night of the soul. However, he continued to be drawn out of these depressions and preached the gospel until he was no longer healthy enough to do so. This film offers not only the public face of Spurgeon, the well-spoken preacher and author, but also offers insight into the personal struggles as well. I have just finished watching C. H. Spurgeon, the People’s Preacher for the second time in less than a week. Yes, this docu-drama is that good. To paraphrase the narrator, Spurgeon’s story is the tale of an unknown country boy who came to the big city to find fame and romance, struggled to overcome his weaknesses, and became the most famous preacher of the day. At the height of his fame, his convictions forced him to take an unpopular stand which left him isolated and ridiculed by the media. However, the story opens with the fifteen-year-old son and grandson of preachers struggling to find salvation. Indeed the story of his discovery of Christ is one of the premier conversion stories of all time, well-told in this movie. After his baptism, his timidity was washed away, and at sixteen, he began preaching despite shaky knees and a pounding heart, pulpit-terrors which would pursue him all his life. So great did he find the ordeal of preaching that all his life he often vomited on Sunday morning. His influence stretches into our contemporary world although it has been over a hundred years since his death. To learn how and why this short, pudgy country boy had so much effect on his own era and our own, watch this video. A few days ago, I watched this docudrama on the life of Charles Spurgeon. It is quite well done and provides a solid, hour-long overview of the life of the Prince of Preachers. It's a great item to add to your church library. 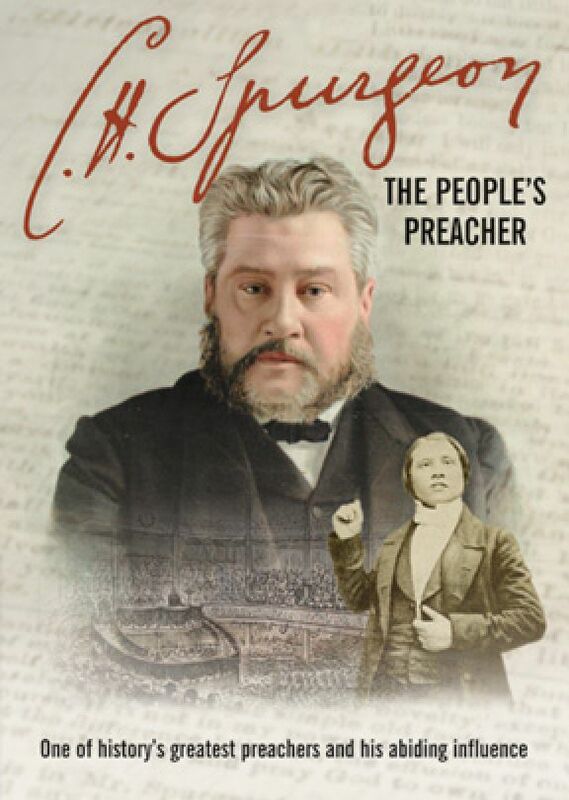 This documentary gives one a good overview of the life and times of Charles Haddon Spurgeon. I never cease from the thrill of reading of his conversion and the film portrayal did justice to the written narrative. I heartily recommend the video to others. Don't forget to watch the Closer Look portion. The interview brings out more detail of the man himself and the ultimate power source God Himself. I paraphrase B.H. Carroll who upon Spurgeon's death commented that a monosyllable explains the man's life and ministry God.